Interested in a career as a quantitive analyst? Working on a computational finance team? Well then, we've got great news! 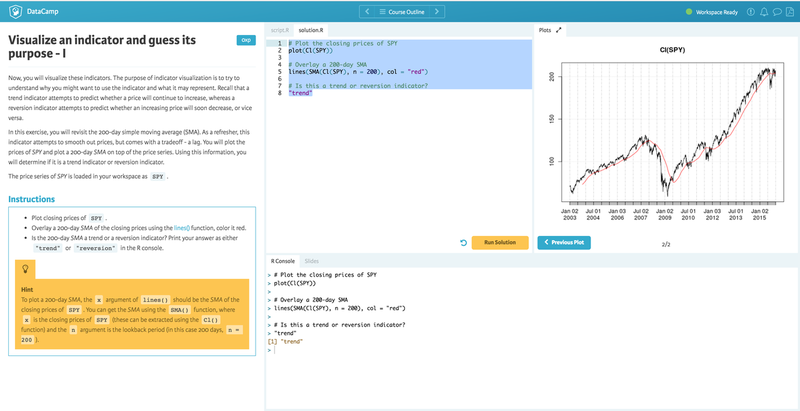 At DataCamp you can now enroll yourself and your team in an entirely new series of courses focused on Applied Finance with R. Learn by doing in the comfort of your browser and at your own pace from experts such as Jeffrey Ryan (author of xts and quantmod) and Ilya Kipnis (co-author Introduction to Quantitative Trading With R) on how to manipulate time series data, build signal-based trading strategies in R, optimize portfolios, and more. There's a reason global banks, hedge funds, and consultancies trust DataCamp to keep their analyst's skills sharp and up-to-date with the latest data science technologies. Still new to R? These courses can get you ramped up to speed quickly! In this introduction to R, you will master the basics of this beautiful open source language, including factors, lists, and data frames. With the knowledge gained in this course, you will be ready to undertake your first very own data analysis. With over 2 million users worldwide R is rapidly becoming the leading programming language in statistics and data science. Every year, the number of R users grows by 40% and an increasing number of organizations are using it in their day-to-day activities. 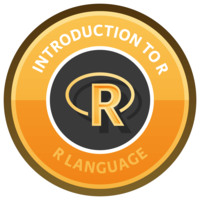 Leverage the power of R by completing this free R online course today! Start Intro to R for free today! The intermediate R course is the logical next stop on your journey in the R programming language. In this R training, you will learn about conditional statements, loops, and functions to power your own R scripts. Next, you can make your R code more efficient and readable using the apply functions. Finally, the utilities chapter gets you up to speed with regular expressions in the R programming language, data structure manipulations and times and dates. This R tutorial will allow you to learn R and take the next step in advancing your overall knowledge and capabilities while programming in R.
Time series are all around us, from server logs to high-frequency financial data. Managing and manipulating ordered observations is central to the all time series analysis. The xts and zoo packages provide a set of powerful tools to make this task fast and mistake free. In this course, you will learn everything from the basics of xts to advanced tips and tricks for working with time series data in R.
Start Manipulating Time Series Data in R with xts & zoo today! This course covers the basics on financial trading and gives you an overview of how to use the quantstrat package to build signal-based trading strategies in R. It will teach you how to set up a quantstrat strategy, apply transformations of market data called indicators, create signals based on the interactions of those indicators, and simulate orders. Lastly, you will learn how to analyze your results both from a statistical and a visual perspective. Start Financial Trading in R today! A golden rule in investing is to always test the portfolio strategy on historical data, and, once you are trading the strategy, to constantly monitor its performance. In this course, you will learn this by critically analyzing portfolio returns using the PerformanceAnalytics package. The course also shows how to estimate the portfolio weights that optimally balance risk and return. This is a data-driven course that combines portfolio theory with the practice in R, illustrated on real-life examples of equity portfolios and asset allocation problems. Start Introduction to Portfolio Analysis in R today! Modeling credit risk for both personal and company loans is of major importance for banks. The probability that a debtor will default is a key component in getting to a measure for credit risk. While introducing other models in this course as well, we focus on two model types that are often used in the credit scoring context; logistic regression and decision trees. We will teach you how to use them in this particular context, and how these models are evaluated by banks. This is a very hands-on course, as you will be learning all of this using a real-life credit data set in R! Start Credit Risk Modeling in R today! DataCamp is the first online learning platform that focuses on building the best learning experience specifically for Data Science. We have trained over 600,000 (aspiring) data scientists in over 150 countries. DataCamp for Business is the most scalable, cost efficient way for managers to train and educate their analytics and data science teams. It allows managers to set assignments based on specific learning goals, monitor progress, and evaluate performance - all in one simple dashboard. Business accounts get access to over 160 hours of engaging content covering every step of the data science workflow. This is 5x more R and Python focused data science content than other sites like Lynda.com at a fraction of the cost of live instructors and in-person training. Our interactive courses see completion rates that are 6x higher than traditional online classes meaning your team will be engaged and motivated to complete their training.